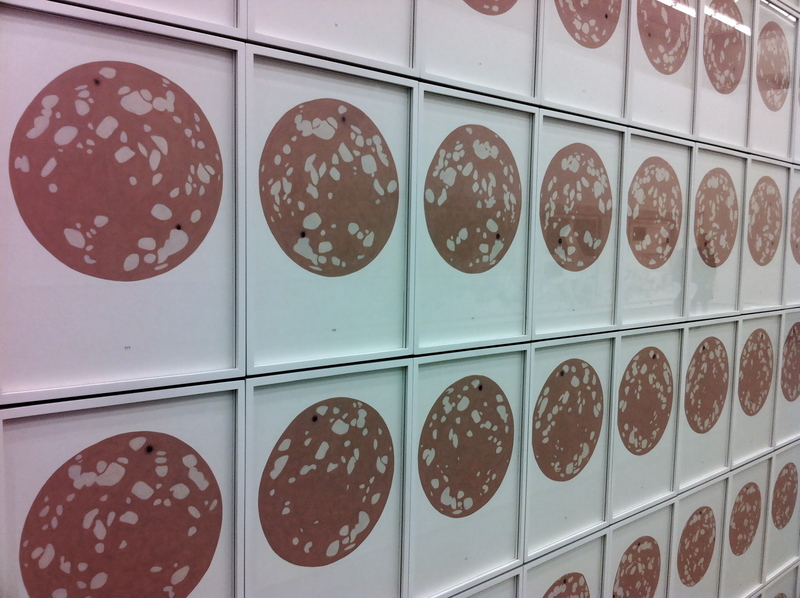 The painted work “Mortadella” (2007-2008) by Christoph Hänsli is also a highly regarded artist’s book and a text by the writer and art critic John Berger (“Ways of Seeing”). Four years after its creation it is for the first time on public display. It consists of 332 individually framed paintings, which are all identical in size and technology: just under A4, acrylic and oil on paper and cardboard. 164 sized tip of a cut mortadella sausage – always two sides. Hänsli has chosen for this task an elaborate technique: hide under the visible surface, eleven building up layers of paint, first few layers of acrylic paint, followed by a multi-revision in oil, sealed with multiple glazes varnish. Also the whitish background is carefully zoom painted , so that the surface of the painted disk appears exactly at the level of cardboard carriers. Total claimed this process 15 months of work. The effort does not serve as a hyper-realistic rendering of the sausage. Upon closer inspection it can be seen that actually the granular structure of the meat mixture can disappear through a monochrome paint in pink. The finely painted peppercorns vary its position. Even if the two sides of a disc is 1.5 millimeters mortadella meat lie, the respective successive painting not identical. The size and position of the white fat and lots of peppercorns vary slightly from image to image. Hänslis interest is the static (upper) surface and the almost endless variety of ways to build them. In the surfaces to write a history, memory and desire, their reproduction is in search of clues. Hänslis dealing with brushes, paints, pigments and glazes is masterful, and he takes for each picturesque challenge an individual solution. His image surfaces seduce the viewer to scan the painting with the eyes to detect the hidden. The conceptual artist Hänsli avoids the personal gesture. As motifs, he often chooses objects that are beaten to everyday barely. He subtly conveys to the spectator. It is more than a description of reality. In its unadorned beauty to draw our attention to the images that surrounds us, and they remind us that we handle large part of our daily lives un-or subconsciously. 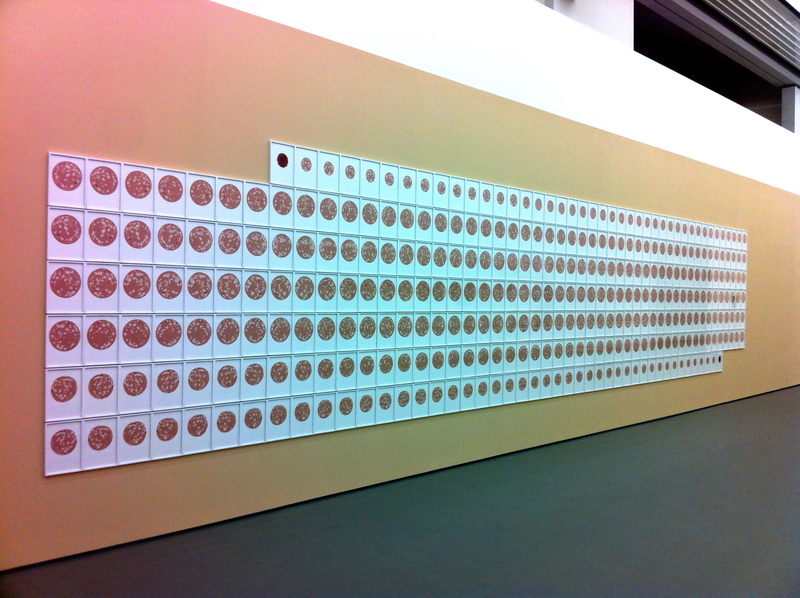 Besides “Mortadella” nine other works (created between 1998 and 2012) of Christoph Hänsli can be seen at Nolan Judin. Including the 22-meter long painting facade. In none of Hänsli pictures ever a man is to be seen, and yet the images always permeated our absurd earthly existence. Without pathos and sentimentality. Despite their striking visual presence do these modern vanitas motifs create an expression of absence and emptiness of the viewer that triggers a wealth of associations. This entry was posted in Art Gallery, Drawings / Painting, Exhibition and tagged Christoph Hänsli, Nolan Judin Galerie.